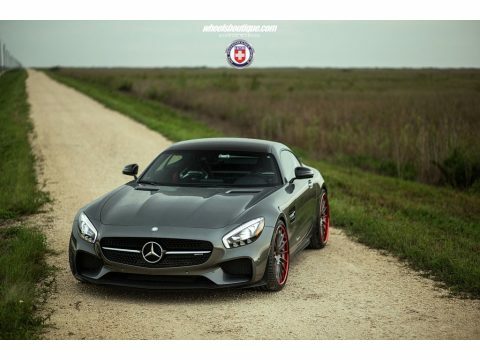 2016 Mercedes-Benz AMG GT S Coupe For Sale in Miami, Florida 33173 If you are someone who appreciates the ideal combination of agility and class than look no further because this 2016 Mercedes-Benz AMG GT S Edition Coupe speaks for itself! This two-seater, two-door fastback coupe encompasses all of the brilliant engineering and forward technology for which the AMG lineup is known. It features a sleek, athletic styling that is dressed to impress. With Selenite Grey Metallic paint complemented by Unique Nappa/Dinamica leather interior, this unparalleled Mercedes is sure to turn heads! Powered by a 4-liter Twin Turbo V-8 engine that is mated to 7-speed automatic transmission, this GT S edition coupe is eager to get out on the road for a proper display of power and performance. With only 1,500 miles you can rest assured that this handsome devil will feed your need for speed, many years into the future! This AMG GT S Coupe comes fully loaded with options and features that are perfect for anyone who expects the most out of life. It has double wishbone front and rear suspension, rack and pinion steering, engine auto start-stop feature, transmission with driver selectable mode, gas-pressurized shock absorbers, front/rear anti-roll bars, and so much more. Additionally, it has been outfitted with exceptional upgrades. Highlights of these advantages include Unique Carbon Fiber Roof, Unique Aerodynamics Package, AMG Night Styling Package, AMG Black Diamond Interior Trim, Full Dinamica Steering Wheel, as well as an Edition 1 Badge. Additional upgrades include: Wheels - $12,500.00 HRE RS103 Dark Brushed Clear Face Polished Red Outer/Inner 20x9.5 (Front) 21x12.5 (Rear) Tires - $1,200.00 Pirelli P-Zero 265/30/20 325/25/21 Suspension - $2,000.00 KW Coilovers Engine - $5,000.00 (620HP, 650Torque) Renntech custom computer tune with E35 capability Renntech blow off valve adaptor BMC performance air filters Paint protection - $2,000.00 Xpel Paint protection This 2016 Mercedes-Benz AMG GT S Coupe has been meticulously maintained. You can easily keep it in like new condition because this Mercedes comes with a 4-year/50,000 mile warranty. This car is a must see to truly grasp its rare and exotic nature. In fact, come see for yourself! You will agree that you cannot find another 2016 AMG GT S Edition Coupe that is this fully loaded for the asking price. Don't miss out on this rare opportunity to own the fast, fun, and fierce car of your dreams at an amazing price. Call today for more information on how you can get behind the wheel of this impressive AMG GT S!! !